‘Tis the season for rosés!! I’ve never been a big rosé fan to be honest, but lately, I’ve been tasting some real beauties, and as the weather warms from spring to summer, you can bet I’ll be cracking a few more corks on the pink stuff. From the faint blushes of Provence to the dark fuchsias from Spain and Portugal, I am loving the PINK! My wine rack would be incomplete without them! And it’s not often we see a Pink from Portugal either. We all know of the beautiful tawnies, rubies and colheitas that come from the Douro region in the name of Port, and always with at least some Touriga Nacional in it. The TN grape is also making some long-lasting un-ports that can stand up nicely to any American Cabs or even some French Bordeaux and for a fraction of the price. I’m quite happy to pay a $26 price tag for a Douro single varietal Touriga Nacional..quite a steal actually. But I digress…I’m here to talk Pink! 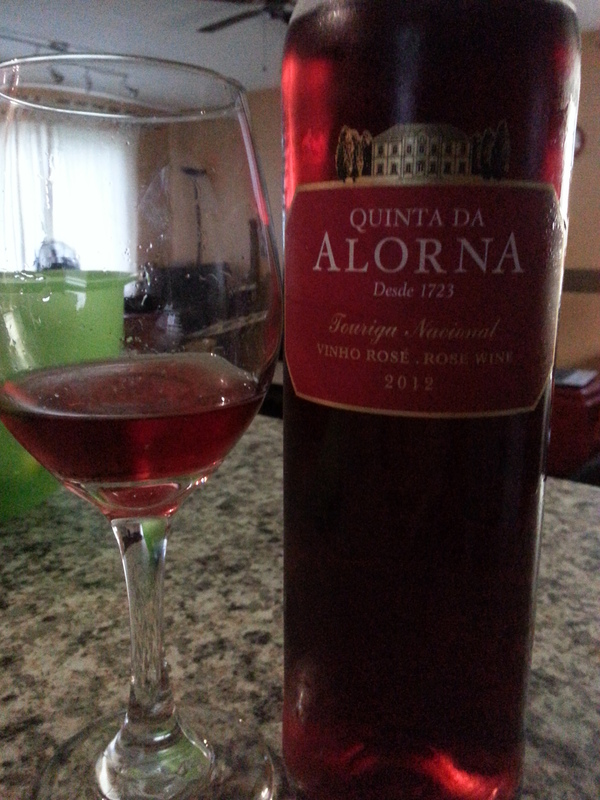 Quinta da Alorna was built in 1723 and vineyards, gardens, orchards and olive trees were planted at that time. This is an estate that has been owned for five generations of the same family, the Lopo de Carvalho family. They take immense pride in their historical estate and are producing quality wines. Red wines yes, but I was mystified to see this deep fuchsia rosé appear on the shelf in the Portugal section. A rosé made from Touriga Nacional? Piqued my interest enough to try it! Rosés are made much like a white wine, but left in contact with the skins for a period of time to extract colour. The longer you leave the juice in contact with the skins, the darker the hue of your rosé. The Alorna rosé is left for a period of 8-12 hours, then the free run juice is gently fermented in stainless at a temperature of 12C. Fresh fruit on both the nose and palate, screaming of ripe strawberries, raspberries and red currants. Fresh and lively, crisp acidity, and a generous finish, this could potentially not just be your summer patio pink, but your HOT TUB pink! Oooooweeee baby!! Yeah! AND…it’s not gonna break the bank either! At a mere $16 a bottle, it makes it easy to pick up a half case (the other half case being a rosé from Provence…you need ALL shades of pink after all…) This little Portugese Pink would be great with all those summer salads, a fresh pasta salad, and of course any kind of sushi or raw fish! Cheers! Or in this case…Salud! This entry was posted in Tasting, Varietals, wine and tagged blush, Douro, hot, hottub, patio, pink, Portugal, Provence, Rose, summer, Touriga Nacional. Bookmark the permalink. We’ve got one coming up in a few weeks on NWTW, love rosé season! Sounds great – I’ll definitely be keeping an eye out for this one! I  Rosés . . . especially some of the “off the beaten path” examples. Rosé just says summer to me!! Salud! !